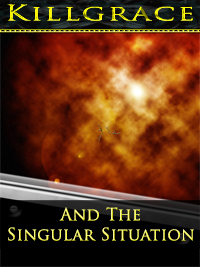 “Killgrace and the Singular Situation” is science fiction for the thinking person. Part of a series of science fiction and historical stories called Killgrace, the novella revolves around a team of scientists who are trying to rescue planet-sized aliens from a black hole while aboard a spaceship. The cast of characters, consisting mostly of scientists and space aviation personnel, are likeable and interesting, especially the two protagonists, Professor Susan Wells and the humanoid Cet Killgrace. The plot is paced well, and the various problems the scientists must solve are realistic (from a scifi standpoint) and do not feel forced. It is worth noting that this novella is firmly rooted in science. Physics concepts, such as the Coriolis effect, are referenced and used to help the scientists come up with a solution for rescuing the gigantic aliens. Although the novella is heavy on the science, it is by no means a physics textbook, and author does include fictitious creations, such as a tugboat-like ship called the Renshaw. The novella’s basis in science and the elegant ways in which the scientists attempt to solve the problem make “Killgrace and the Singular Situation” a recommended read for any serious science fiction fan.